Electricity generation from stochastic renewable energy sources, such as wind and solar power, has a non-negligible impact on electricity markets. 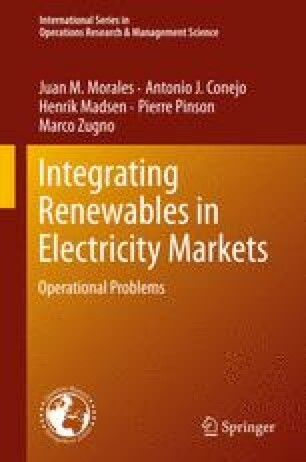 The origins of that impact relate to the economical aspects of stochastic renewable energy in electricity markets (the socalled merit-order effect), the variability and predictability of their power output, as well as the nonlinear and bounded nature of the electric power generation process itself. The way this impact materializes for the case of different market quantities (e.g., dayahead prices, system imbalance magnitude and direction, etc.) is further analyzed, while the underlying mechanisms are presented. Methodologies for the empirical analysis of that impact are finally described and applied to the case of the Nord Pool market in Scandinavia. Give a simple and intuitive proof of the properties of the impact of stochastic power generation on market-clearing outcomes (system price and volume) expressed by Eqs. 6.4 and 6.5. Place yourself in a single-auction market-clearing procedure. Propose your own supply curve with 10 production offers (quantity and prices), one of them being for wind power generation at a short-run marginal price of zero. Similarly, define a demand curve with 12 consumption offers (quantity and prices). Obtain the market-clearing outcome, that is, the resulting system price and quantity. As an extension of the above, replace the “fixed” wind power generation offer by the realization of a Gaussian random variable, with mean and standard deviation of your choice. Simulate the market-clearing outcome (resulting system price and quantity) for 100 different realizations from that random variable. Visualize the histograms of prices and quantities. Are they also Gaussian? Why wouldn’t they be? Subsequently, repeat the same procedure with different mean and standard deviation values for the Gaussian random variable, and analyze the resulting distributions of system prices and volumes. Consider the distribution of potential wind power generation by a Beta random variable \(\text Beta(1,4)\) (units being gigawatt hour), with a forecast of 0.2 GWh used at the time of market clearing. What is the distribution of forecast errors, following the discussion in Sect. 6.3.2? Given a threshold \(\tau=20\) MWh, find the probabilities for I B of positive and negative imbalances, as well as no balancing needed. Then, visualize the distributions of potential positive and negative imbalances. Consider the same conditions and distributions as in the Exercise 6.4. Follow the reasoning of Example 6.7, with the same upward and downward balancing offers in the balancing market as in Table 6.7 and recalculate the probabilities of each of the participants B1–B6 being the marginal generator. What is the probability that there will not be enough balancing power?